So, you got your fencing and stall done. 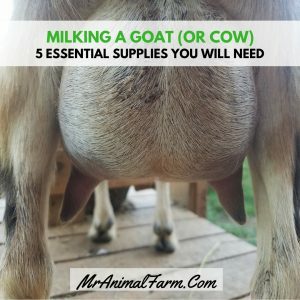 You have your goat, but you aren’t sure what goat milking supplies you will need when it comes time to start milking your goats. Of course, don’t forget that in addition to getting the right goat milking supplies, you will also need to learn how to milk your goat. Milking a goat (or cow) may seem like there will be a lot involved, however there really is not too much to get. In addition to the basic goat milking equipment below, you will also need a milking stand which you can purchase or build. This is perhaps one of the most important pieces of goat milking equipment. You want a stainless steel milk bucket, not a plastic or glass or any other material type. 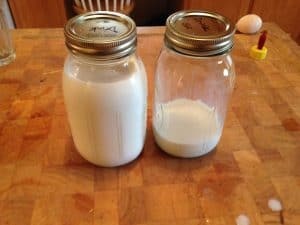 Without a milking pail, you won’t have anything to actually milk into. A stainless steel milk bucket is your best choice because they are easiest to keep clean. It is, of course important to keep your goat milking supplies as clean as possible since they are handling your raw milk. Materials like plastic can hold in bacteria which you definitely don’t want. Stainless steel is non-pourous, so it is less likely than say plastic to harbor bacteria leftover from the milk residue. Since we have mini goats we went with a smaller 2 quart one. 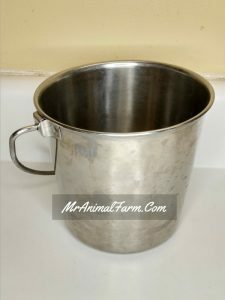 Obviously if you are milking a cow or standard size goat you may want a larger capacity pail. 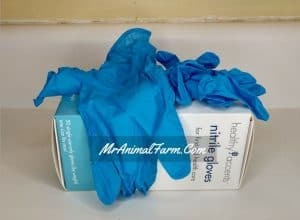 Gloves are one of the most simple and inexpensive goat milking supplies. 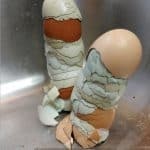 You can get these at your local grocery store. 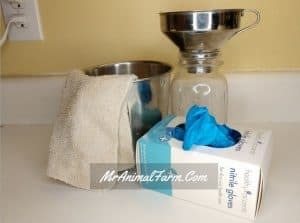 You will want to wear gloves to cut down on germs from your hands to the milk. 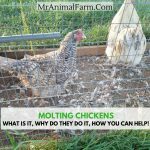 You will also want to change your gloves between goats (if you are milking more than one) to cut down on germ transfer between udders. These are a must have in your milking supplies. You can get all kinds of fancy udder wipes. 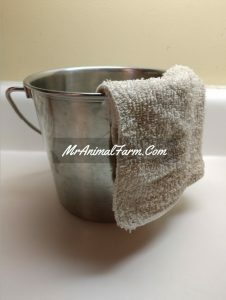 We just use a good ol’ fashioned washcloth that has been put in warm water (no one wants a cold rag on their udder!!). Whatever kind of udder wipe you choose, it will be an essential milking supply. The reason to use udder wipes is to get debris off the udder so it doesn’t go into your milk pail as well as to keep dirt and germs from getting into your goats teats. There are lots of other fancy milk strainers out there to choose from. Basically, you want the holes in the milk strainer to be small enough to catch any dirt/hair that may have made it into your milk. 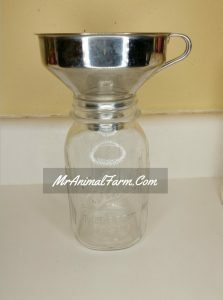 Again, like with your stainless steel milk bucket, using a milk strainer made from stainless steel is the best choice. It will help keep your milk the cleanest that it can be. We tried a few different strainers when we started and we like this milk strainer the best. Of course, you’re goat milking supplies wouldn’t be complete withoutsomething to hold the milk in when you are storing it in your fridge. 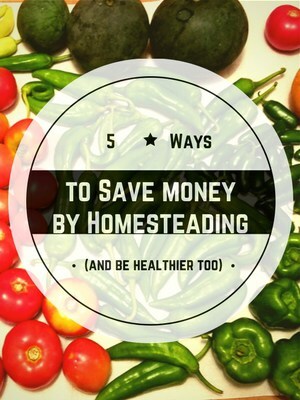 We use glass quart canning jars. They are just the right size, have easy screw on lids and are easy to wash in the dishwasher. These are the 5 goat milking supplies that we recommend as a base to get started. If you have several goats in milk and don’t want to hand milk your goats – you can also think about goat milkers. Goat milkers are not an absolutely essential piece of goat milking equipment because you can do the job with just your hands. However, when you start getting several goats to milk each day it can start to become rather time consuming and that is when thinking about adding a goat milking machine might me wise. Goat milkers are not particularly cheap, so it will be something you need to weigh out. The money spent versus the time savings that you might get by adding a goat milker can be worth it. 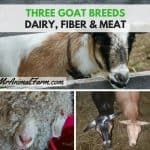 What do you consider your most important goat milking supplies?